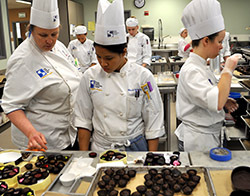 The highly regarded Culinary Arts Program at South Seattle College provides students an extensive foundation of classical and international techniques, skills, and working knowledge. Our students not only learn to cook from savory to sweet for the modern palate, but gain skills in production, service and management to become well-rounded professionals ready to rise in the culinary field. They consistently win awards at various state and national competitions. For more information. Kathleen earned BA and MA degrees in Home Economics at Long Beach State College, now CSULB. She taught junior high school in Long Beach; high school in Los Altos, CA; elementary school at Escola Americana in Rio de Janeiro, Brazil and part time in the Home Arts Division at Shoreline Community College in Seattle. She worked in food recipe development at Pacific Kitchen in Seattle, and as a freelance writer focusing on food preparation. Kathleen published five cookbooks and over 150 food related articles in magazines and newspapers. She was a founding member of the Seattle Chapter of Les Dames d'Escoffier.